It is better to use atan2 function than atan function as described here. Note the warning on this page about the order of operands. For issues concerning asin and atan see here. Most trig functions (except openGL) use radians not degrees. This is what the java Math functions return for instance. I think this makes sense in the context of finding euler angles because we would usually want to rotate the shortest angle to rotate. If you have a different result from that shown on this page it may be that you are using different standards, I have tried to keep the standards consistent across this site and I have tried to define the standards that I am using here. One of these standards is that the order that the euler rotations are applied is 'NASA standard aeroplane' it uses a slightly different coordinate definition from VRML (z and y axis swapped). Also when working with aeroplanes we often work in terms of the position of external objects relative to the aircraft (i.e. the inverse of its position transform as explained here). therefore to get the expression normally used with NASA aeroplane we invert all inputs (change sign of every term with odd number of sine terms) invert output (conjugate quaternion) swap z and y for inputs (swap z and y columns) swap z and y for outputs (swap z and y rows). In the case of aircraft it can make sense to work in terms of the local frame of reference of the aircraft looking out, I have a version of this page that does that here, but be careful as this will no longer be compatible with the rest of this site. However if you have checked these things and you still have a discrepancy then I have probably made an error so please let me know here. If you are working with different Euler Angles see the 'Alternative Euler Angle Sequences' section below. This works at all points except the singularities at attitude = +90 and -90 degrees, at these points we will get atan2(0,0) for heading and bank which will return 0 although this is not a valid result. We therefore need another way to work out heading and bank at the singularities. Here we calculate how to detect the singularities and then how to represent them in terms of quaternions. the north pole is shown on the left and the south pole is shown on the right. Thanks to Vitor Barata for correcting a previous error here. In order to try to get an intuative understanding of the singularities involved in converting other representations of 3D rotations to Euler angles it may help to look at the way we project the surface of a sphere onto a 2 dimensional map. This is a different case and it only involves two angles, latitude and longitude, but this simpler example may show the principles. This analogy is explained in more detail on this page. At the north and south poles longitude does not matter so if we are converting some other description of north pole to latitude, longitude it might give any value for longitude, for example, infinity. So we have to be very careful at these points. On this plane lines of common orientation are diagonal lines, that is rotation around 0,1,0 axis are given by angle = heading+bank. Similarly for the south pole. If we had not used the atan2 function then one of the intermediate steps would involve infinity (division by 0) therefore most maths libraries have an atan2 function to avoid this step. Most maths libraries use radians instead of degrees (apart from OpenGL). You may be working with a program which uses a different Euler angle sequence. You may need the singularities to be at different angles so they are less likely to cause problems. The objects that you are modelling may just favor a different set of angles. Amy de Buitléir has written this document and kindly allowed me to publish it here. This shows how to convert a quaternion to any Euler angle sequence. 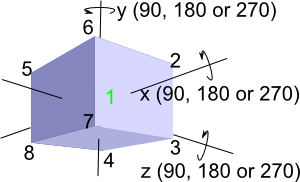 Instead of defining the quaternion in terms of rotations about the absolute coordinates i, j and k the document defines 3 mutually perpendicular axes e1, e2 and e3. So, to generate the mapping for a given set of Euler angles the user needs to map e1, e2 and e3 to i, j or k in the appropriate order. This involves the value e which seems to define a sort of left or right handedness, but on its own this is not enough to define the Euler angle sequence, will still need to define the e1, e2, e3 to i, j, k mapping. Or enter the quaternion below, then click calculate to get the heading, attitude and bank in degrees.